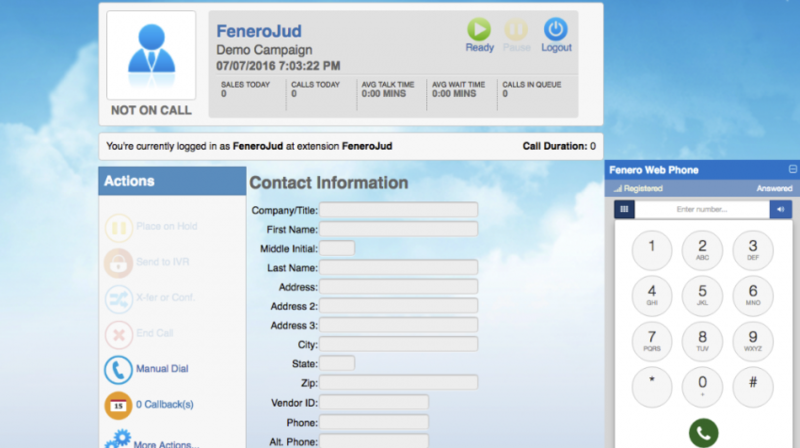 Fenero, a contact center software platform provider, today Aug. 3 announced the release of its newest feature, the Web Phone, a cloud-based SaaS communication and telephony application that operates inside a browser. In an exclusive, Small Business Trends was given advanced details about the application, which enables contact center agents to make voice calls without the need for additional hardware or other third-party software. Using the Web Phone, contact centers will save 70 percent of contact center software, hardware and telephony costs, compared to alternative providers, according to information provided by the company. It will also help businesses set up contact centers faster. Because it’s in the cloud, the Web Phone removes the necessity for expensive IT hardware setup, support, maintenance and licensing fees typically associated with more traditional PBX systems, the company says. According to Callari, the only things needed for the Web Phone to work are a browser, USB headset and stable Internet connection. Agents just log into the Fenero platform via a browser (Callari recommends Chrome or Firefox, as they fully support the Web Phone technology) and start taking calls. Callari said the Web Phone comes with all the features you would find on a regular mobile phone: the ability to put a caller on hold (it also includes music on hold), transfer the call or mute the phone. The dial pad also looks like a mobile phone. The Web Phone includes click-to-call functionality, and all calls are encrypted, to guarantee security. Also, it needs no installation and requires almost no setup. Cost savings is the chief benefit to using Fenero’s Web Phone, and that expresses itself in two ways: expenses associated with hiring and equipping agents, and infrastructure costs, compared to traditional PBX alternatives. According to Callari, traditional call centers experience very high turnover, as much as 100 percent. The beauty of a cloud-based SaaS platform like the Web Phone, Callari said, is that it doesn’t matter where an agent works — in a call center or from home. The need for fewer agents on-site means lower equipment and maintenance costs, and paves the way for hiring from anywhere in the country or across the globe. Because the Web Phone’s functionality resides in the cloud, there are no hardware setup, maintenance, tech support and licensing fees, which can run into the multiplied thousands of dollars, even for a small company. Also, unlike more traditional options, there is n charge for the software, although there will be a small fee for feature upgrades. As to ongoing fees, according to Callari, Fenero is “disrupting” the industry in that it charges based solely on usage — 2 cents per minute — not per seat, which can run anywhere from $150 to $250 per month. Dedicated tech support does require an extra fee, he said, but that’s on an as-needed basis, not part of an extended contract. With that, users can have Fenero do the complete setup. The company also provides training as part of the support package. The Web Phone is available for use now. Visit the company’s website for more information.